A new DVR with a never-before-seen feature doesn't come around every day, and if it's the sort of amenity that works in every room of the house, without compromise, then we just have to review it. What would make the list? 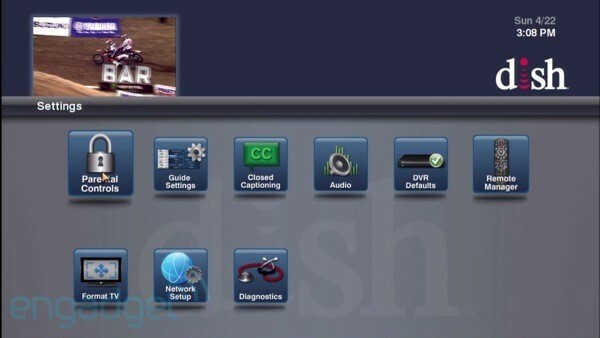 Try the Dish Hopper whole-home DVR, which can record six shows at once. Of course, there are specs and marketing claims, and then there's real-world performance. Is this set-top box everything we could have dreamed of? There's only one way to find out: you'll have to meet us past the break and take a walk through our full review. Although the Hopper offers some unique features you can't find anywhere else, it leaves big-enough holes to prevent us from calling it our favorite. How would you rate the Hopper? Any time we write a DVR review we have to remind ourselves that the world we live in doesn't afford most people the luxury of choosing a DVR. What we mean is that usually DVRs and their software are tied to specific providers, and thus aren't available to everyone. So our questions in a DVR review are two-fold: would we switch to a provider who offered this DVR? 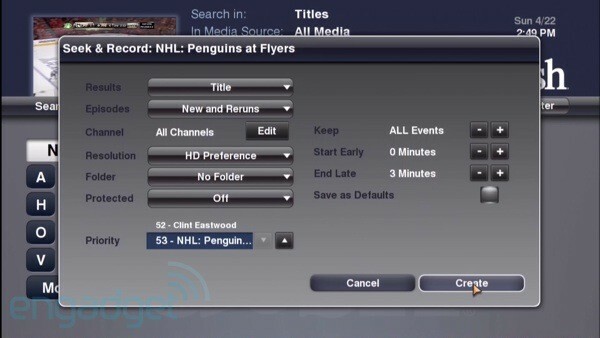 And how does it compare to third-party options like Windows Media Center or TiVo? The Hopper is a good-looking and solidly built box, with just about every input and output on the back you'd expect on a DVR. 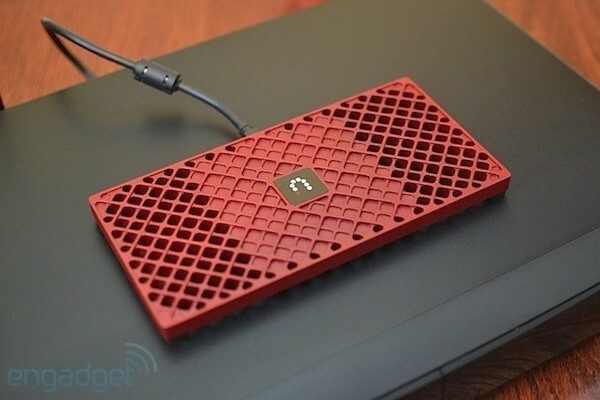 Only a single coax input is required from the satellite, and there's an eSATA port for adding external storage to complement the 2TB of built-in space (half of which is for your use). As it happens, that internal drive can also be used to transfer recordings from your old Dish DVR. There are both HDMI and component HD outputs here, as well as the old-school red, white and yellow for the Luddites. For whatever reason, the designers stuck two Ethernet jacks on here. Finally, as with most DVRs, the power supply is internal. Overall, the Hopper is exactly what you'd expect a DVR to be: about the same size and weight, and adorned with a glossy finish that will easily blend into your home theater setup. On one end there's a USB port (with two more 'round back) and on the other is a door, behind which you'll find a smart card slot and a few essential buttons like power and reset. Finally, two LEDs sit in the center to indicate when the box is on or if it's recording. Thankfully, neither of these is distracting or crazy bright. There are still a few hardware features yet to be explored, like Bluetooth for headphones and Zigbee for remote control (currently that feature only works with the included remote). There's an IR input for legacy programmable remotes, but no HDMI-CEC to simplify setup or IP control to integrate with home automation controllers. The other hardware feature coming soon is an optional over-the-air tuner, which we consider a requirement for anyone who watches PBS (Dish doesn't carry PBS HD in all markets, don'tcha know). The little multi-room client, known as the Joey, is just what you'd want in a streamer: compact, lightweight and replete with various mounting options. Its small removable base has holes perfect for wall-mounting or to wire tie it to the back of an HDTV. The base can be attached to the Joey vertically or horizontally, and can be attached after the mount has been fastened to make the installation easier. The outputs are much more sparse than on the Hopper, but while component HD outputs are missing, optical audio, HDMI and Ethernet are all there. Unlike the Hopper, the Joey has a wall-wart power supply. The coax is used to stream content from the Hopper for multi-room viewing, but an Ethernet connection to your network is still required for things like DLNA, some video on demand services and interacting with the smartphone and tablet app remotes. If you can't connect the Ethernet, you can buy the optional Hopper Internet Connector to bridge the IP between MoCA to Ethernet since the Hopper can't do it; standard MoCA bridges aren't compatible. One last feature worth mentioning is SRS TruVolume (also offered on the Hopper), which helps spare you the pain of loud commercials. We've never met a provider remote we liked, and the ones belonging to the Hopper and Joey are no different. We've never met a provider remote we liked, and the ones belonging to the Hopper and Joey are no different. It at least makes for a experience, though, since the same remote works for both the Hopper and the Joey (labels are included in the box to help distinguish them) and we love the way Dish made use of the two-way Zigbee RF control to avoid IR and also to simplify the remote-programming process. Here, you'll use on-screen menus to save yourself from programming the remote by entering codes on the keypad. This also comes in handy for helping find the remote, if you misplace it. Speaking of which, although the remote controls the Dish and Hopper via RF, there's an IR emitter to control your TV, disc player or AV receiver. That's the good news. The bad news is the layout couldn't be any more annoying. One oddity we're not sure we can ever adjust to is combining the up and down arrows from the D-pad with the channel up and down. Another unorthodox touch are the volume buttons, which aren't stacked on top of each other, but instead sit side by side -- and at the top of the remote, of all places. 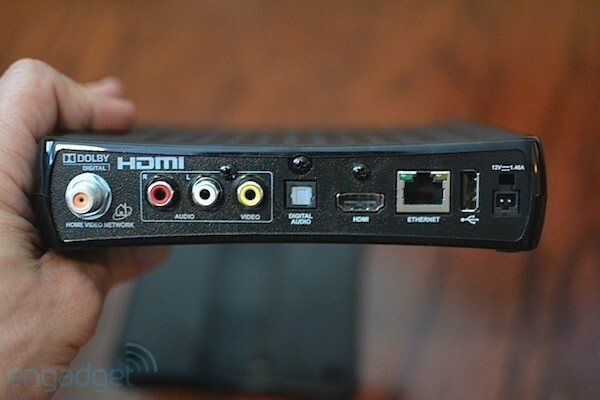 There are also two power buttons, one for the TV and one for the receiver, although we're not sure why anyone would use the Dish remote to turn on one and not the other -- another reason we wish it had HDMI-CEC. The transport buttons pick up where the navigation buttons left off with separate pause and play buttons, even though the centrally located pause button can also be used to un-pause (or play, if you prefer). 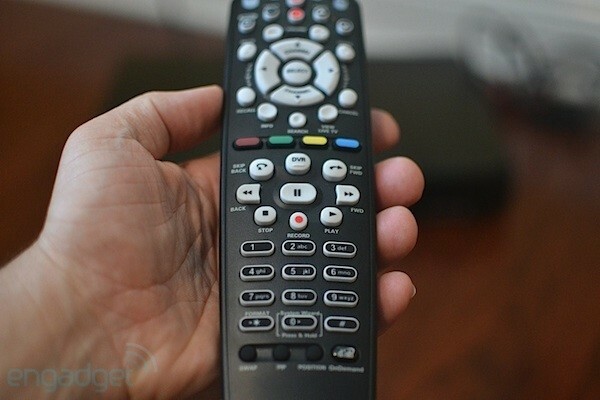 We wouldn't go so far as to say you can't get used to it, though, and since the remote resembles remotes Dish has issued in the past, we're sure existing customers will feel right at home. Now for the good stuff: the DVR button is front and center where other providers put shortcuts to their video on demand service (the Dish VOD button is on the button right). That DVR button will toggle between recorded TV, timers, scheduled recordings and PrimeTime Anytime content, so it's quite handy. Just a bit above that, but still in the center, is the search button, which makes it easy to search for upcoming shows, as well as things that are in the middle of airing or were previously recorded. Speaking of search, the usual on-screen keyboard is present, but the number keys also have the T9 style letter labels so you can use that for search instead. If you loved the Dish 922 guide and user interface, then you're going to love the Hopper: it's basically the same thing. If you recall, the 922 was originally announced to have a remote with a touchpad and while we've put it out of our minds, the Dish developers have not. What we mean is that the user interface is obviously still based on it, but is navigated with a D-pad. The main navigation menus and even the recorded TV screen calls to mind Finder or Windows Explorer. Prefer the list or detailed view? Tough luck. Also like most computers, there's a cursor to show what you're about to select. You can choose the size and the color of it, but you can't choose another way to highlight objects. 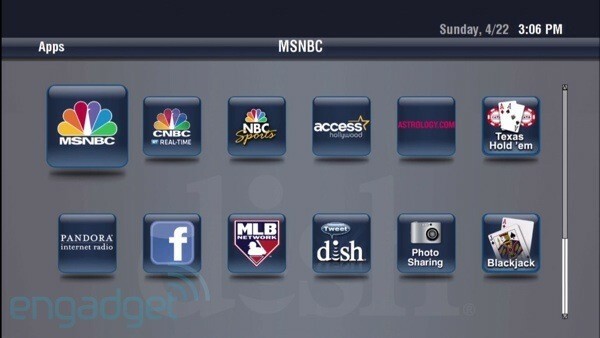 As for navigating, some DVRs use the left button to go back, others have a back button, the Dish DVR has cancel. This makes sense, but in some instances it doesn't take you back where you were and you have to use left instead, other times it takes you back but not exactly where you were. This can be a bit annoying at first until you figure out which is which, and if that isn't completely clear, there's also a stop button, that won't save you from the spoiler window, to quickly deal with a recorded show you're done with. There are also a few hotkeys that remind us of an older Nokia UI, like menu+menu, to go directly to system info. Beyond basic navigation there are a few other mentionable features that don't fit in the following sections. There's the ability to adjust for over-scan as well as a method to backup and restore some settings (but not recordings). There's not an option to pass through the native resolution of the content with the exception of 1080p24, though. 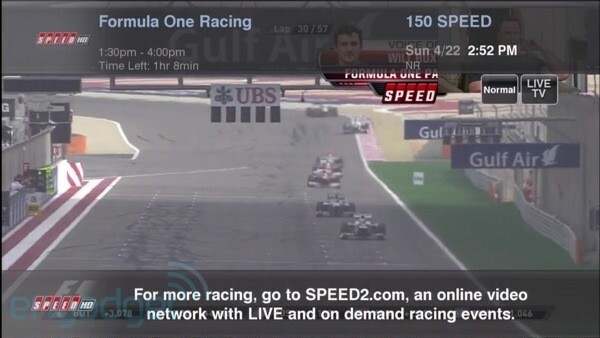 Video on Demand is displayed both as channels and in grids. The grid isn't much easier to navigate than the competition's, sadly, but you at least have an easy way to filter out the pay-per-view stuff. The easiest way to find things is to use the search button on the remote. These searches can be used to find any and all media, just things from the guide, or video on demand. You can even search your recordings, or what's on right now (including just displaying live sports). The bottom line: there is no shortage of ways to search here. As with every other provider-issued box, what's missing are over-the-top services like Amazon, Vudu, Netflix and Hulu. We frankly don't expect any video service provider to ever willingly put its competition on a level playing field, but there are some DVRs that do, so it's an important point to note. That's not to say there aren't any apps, because there are a few like Facebook, Pandora, MSNBC, NBC Sports, MLB and even a Twitter client. Apps are obviously a must-have these days, but the limited selection and typical implementation makes them something we think you'd easily forget. The grid guide displays what's on six channels for three hours and is oddly arranged in descending order by default, but you can easily correct that in the settings. Overall, it's quite snazzy, but it's nonetheless a typical grid guide with a non-removable spoiler window in the top left corner. There's no list guide to quickly glance at upcoming shows on one particular channel, and there's also no color-coding for sports, news and the like. The recording indicators in the guide are much appreciated, and something no DVR should be without. The channel numbers are listed on the left where you'd expect them, along with spiffy logos sitting just to the left. The HD channels are marked with big, almost transparent letters behind the channel number. Sadly, there's no HD indicator on the individual programs, but there is if you hit the info button. The local channels have odd numbers like 003-000 instead of just 3 and the HD simulcasts of the SD channels share the same number, where the HD channel comes on if you direct dial it with the remote. 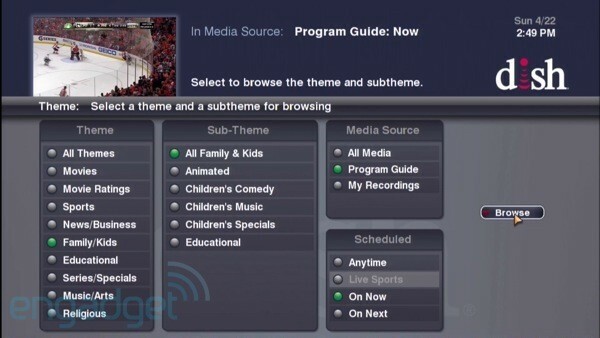 There are pre-defined channel lists to filter the guide such as My Channels, My HD Channels and All Channels and you can customize four more lists -- any of which can be set to the default. One interesting feature that we've never seen is the ability to collapse channels into one square. 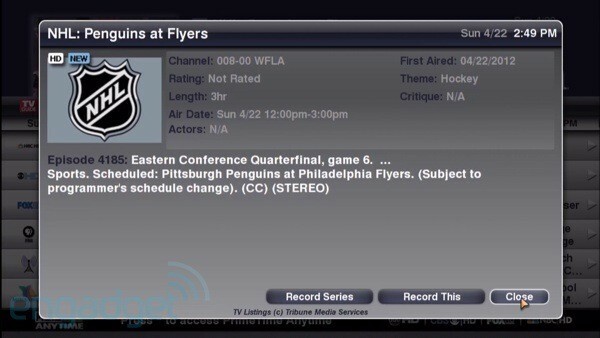 This is especially useful for the seemingly endless music channels and sports packages like NHL Center Ice -- but the feature is noticeably not an option for the one hundred channel one Dish Cinema channels. There's also a mini guide, which can be summoned by hitting the right button and lists what the next two shows are coming on a particular channel. Oh, and there's a new way to discover what's on here too. Hitting the left button brings you to a browse menu that allows you to choose a theme, sub-theme, media source or schedule. Essentially you can return an icon list of all the live golf events that are on right now, or all the animated movies that are coming up. Navigating the search results and finding your way to a record button involves a little more clicking than we'd like. Navigating the search results and finding your way to a record button involves a little more clicking than we'd like. One annoying thing is that the results are not displayed in a list, and the results turn up single episodes instead of shows, so these lists are long and somewhat confusing. There are recording defaults, thankfully, but the all-important new and rerun versus first-run-only isn't one of them. We'll talk about PrimeTime Anytime later, but we'll say this: without it there are only three tuners, which means you'll probably run into some programming conflicts -- especially if you don't live alone. The conflict resolution screen is not one of our favorites; in fact, it took a bit of study to even understand what we were looking at. Why it's so hard for DVR developers to provide a simple list of shows and let you check any three is beyond us, but almost no box maker gets this right. You can, of course, set priorities to help the Hopper automatically resolve conflicts, and either check the guide or the list of scheduled recordings to see what's on deck. One thing you cannot do, however, is select a show in the guide or recorded TV and quickly find out about upcoming showings. You can select the show, hit the search button which automatically searches for that show in the guide, which finally returns the latest upcoming episodes for that show. It isn't exactly intuitive, though. If there's something you want to record, but you can't find it through search, the Dish DVR equivalent of a wishlist or keyword recording is called Seek & Record, which simply records whatever your saved search turns up. Enough about finding stuff to record; it's finally time to relax and watch something. The quickest way to do this is to hit the DVR button on the remote and the screen becomes filled with a grid of icons representing what's available for playback. The red, green, yellow and blue buttons on the remote offer quick access to various views to assist in finding something to watch which includes the ability to arrange recordings in folders by title, genre or custom folders. The idea of organizing content by genre is a great one, but missing from the genres is comedy and drama. Instead all the TV series are in a single folder. Sports, family and movies are there, but the feature only has limited usefulness as long as the main categories are missing. You can manually move recordings into custom folders, though, one at a time or in batch using the "Edit All" menu option -- the other edit all options include delete, protect or un-protect. The other way to manage what shows up in custom folders is to configure the destination when scheduling the recording. Custom folders are pretty unique for a DVR and appreciated, another thing missing that other DVRs do have is the ability to display a list of recordings. This is especially odd since it's possible to display a list of scheduled recordings or timers. Another thing we don't understand is why the program that's currently recording is displayed at the top of the grid of icons, regardless of if you've chosen to sort by DVR date, alphabetically or by rating (view by rating is a great way to ensure kids' shows are at the top, since children's programming is the lowest rating). Each square in the grid contains a show graphic, as well as the name of the program and a number to indicate how many episodes are in that folder. When you drill down into a folder, shows are displayed in a list with the details of the show on the right that includes both the recorded date as well as when the show first aired. Each episode listed also shows a green bar to indicate if you've watched any of it, and if so, how much. Selecting a show brings you to a context menu where you can get even more details about the show, edit, delete or play it back at the beginning or from where you left off (you can hit play instead for quicker access to resume). Playing a show is much like any other DVR with the usual transport controls, including stop, which does exactly what you think, but also provides quick access to a menu allowing you to easily delete the show, resume, watch some live TV or return to the list of shows (not where you were last, unfortunately). There's also a 30-second skip feature, which is what it sounds like, and a "skip back" option that returns you 11 seconds. In either case, hitting skip won't bring up the scrub bar. The play and info buttons also don't reveal your current point in the show; in fact, the only way to know how much time is left is to pause or the old fashioned fast forward or rewind. Speaking of which, the fast forward and rewind are very quick, 300x in fact, which comes in handy since there isn't any other way to quickly get to a specific spot in a long recording -- like TiVo's skip to tick or chaptering on the Verizon DVR. The scrub bar does show how much time is left in the show, vs showing you how much you've watched, which is the same thing sans some math. One thing it doesn't display, however, is the current time. So if you are interested to know if you can finish the current program before it's time for bed, you'll need to press two buttons, pause then info. Believe it or not, most people still hit the guide button before the DVR button when they sit down to watch TV, so the live TV experience is as important as ever. We've covered the guide already, but there are a few notable things about watching Live TV on the Hopper or Joey. 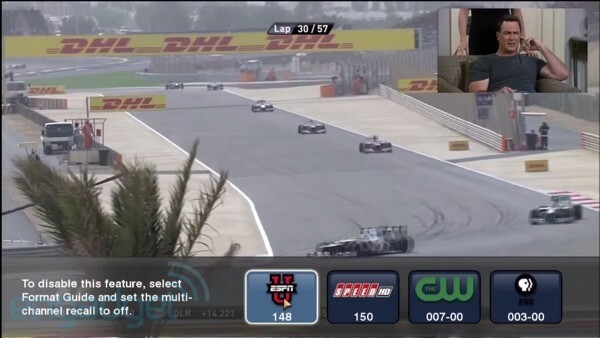 First off, you can always quickly get to live TV from with the dedicated View Live TV button. Changing channels, which takes about three seconds, always brings up a channel banner, but some channels have an annoying second banner at the bottom. The main banner does include what you'd expect with the addition of the amount of time left in the program. Interestingly, pressing the info button doesn't bring up the channel banner, instead it brings up the full screen translucent info screen, which includes shortcuts to record the show or create a series recordings. The transport buttons work exactly as they do during playback of a recording with the addition of the record button providing one press recordings. A second press of the record button gives you the ability to add a buffer to the end, which is especially useful if you decide to record the rest of a sporting event you are watching (the live TV buffer is not included when you hit the record button). 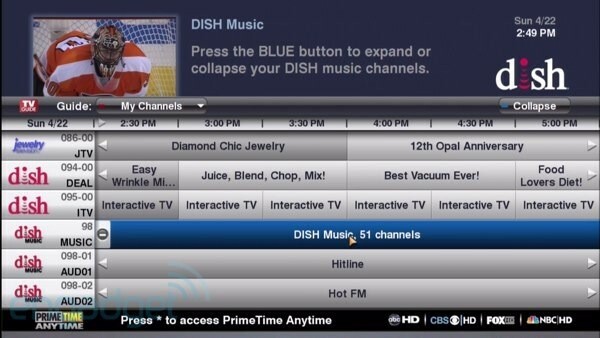 Again, Dish delivers with some unique features with live TV, including PIP -- sadly PIP is unique these days -- and a multi-channel recall menu. The PIP works as you might remember and is the only way to maintain dual live buffers. You can, of course, move the smaller window wherever you want, change its size and quickly switch between the two streams. 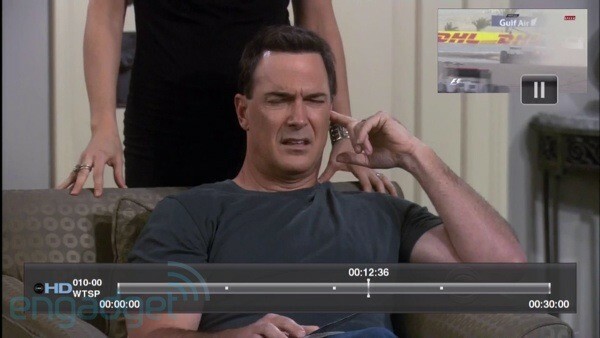 You can even choose to watch one recording and one live show using dedicated PIP buttons on the remote. We mentioned earlier that you have to use PIP instead of the more familiar recall button if you want dual live TV buffers, which is too bad because of the very cool multi-channel recall menu. It works like this: you hit the recall button and instead of instantly switching to the last channel your were watching, you're met with a menu allowing you to select from anyone of the past four channels you've watched -- don't worry, if you prefer, you can set the recall button to fork in the conventional way. One last note worth mentioning is that if you happen to be watching live TV when a scheduled recording is about to start, you are given a 30-second warning with the option to cancel the recording or allow the DVR to change the channel. Without a doubt the most interesting feature of the Hopper is what Dish calls PrimeTime Anytime (PTA) -- a feature so cool our first thought was it was only a matter of time until the networks file suit. In brief, its mission is to retool the DVR experience so that it requires even less forethought. What we mean is that as much as we love DVRs, the planning and configuration required to make the most of it is fundamentally different from the traditionally passive experience TV-watching is supposed to be. That all ends with PTA, which you turn on with a single setting and which opens your current viewing options to everything that aired on the big four broadcast networks in the past eight days. Here's how it works: Dish broadcasts the four major networks on a single satellite transponder. This allows the Hopper to use a single tuner to capture all four streams at the same time, while freeing up the other two tuners for other duties. Effectively this gives the Hopper the ability to record six shows at once during primetime. Because these are the same four networks that typically only broadcast their programming once, it's the time with the most DVR conflicts. It is a single setting because Dish sets which channels are included (ABC, CBS, NBC and Fox) and defines the time itself. Monday through Saturday, the recordings start at 7:55 PM and end at 11:08 PM; on Sunday, programming starts at 6:55 PM. This is not configurable in any way and you can't set an extra buffer to deal with the CBS Sunday night problem -- no CBS, no one is expecting 60 Minutes to start at 7PM. PTA is automatically extended if the show runs past 11 PM according to the guide, though, so in the case of an awards show. 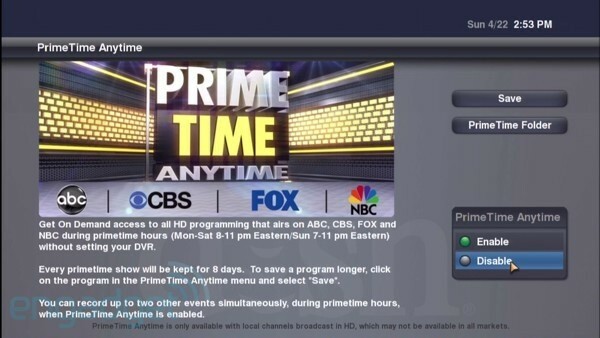 All of the PTA programming is available via its own view that can quickly be accessed with a second press of the DVR button. This includes all the same folder options we discussed in the DVR section with the exception of custom folders and with the addition of the ability to put in a folder by Network. The PTA content is stored for eight days, unless you select a specific show to save or chose to schedule a timer for a show, in which case all the episodes are stored as if they were recorded with PTA disabled. An interesting caveat here is that the early start and late end buffers that you can configure when setting up a series recording don't apply if the show is recorded on one of the big four networks during primetime, if you have PTA enabled. This might be a problem, but is somewhat mitigated by the fact that when you playback a recording during the eight-day period, when one show ends, the next one begins automatically with the only indication being the info screen displaying different information. This is really interesting because you can actually watch every show from ABC, for example, one night back to back without ever touching the remote. When all is said and done, we really appreciate PTA because it allows us to discover shows anytime after they first aired, so if you learn of a great new show while wasting time at the water cooler, it isn't too late to go home and watch it or choose to save it for a later viewing. It's a step towards a future where we can watch whatever we want without having to plan in advance or consult a list to make sure our shows will be recorded. What else can we say? It just works. We do wish we could extend the feature beyond primetime, and record, say, every football game that might be broadcast on the same transponder. The Hopper offers some unique, desirable features that you just can't get anywhere else. DVRs with multi-room viewing have been around for a long long time. In fact the ReplayTV 4000 series featured the ability to watch a recording on a DVR in another room ten years ago and TiVo has had it for almost as long. 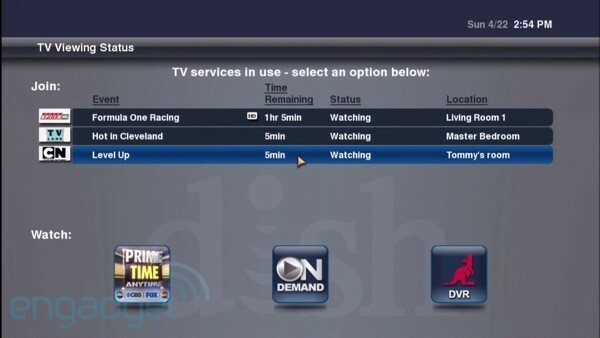 Even the older Dish DVR enabled users to watch a show in SD on a TV in another room of the house, but this is different. What makes this setup unique is that the experience on the Joey's is nearly indistinguishable from what you'll get on the Hopper. There's no transferring, no walking to the other room to schedule a recording to resolve a conflict. The consistency of the experience is crucial: ideally, TV should just work no matter what room you're in -- like cloud services, only at home. There have been other multi-room DVR experiences in the past, with the most notable being U-Verse and Windows Media Center. But they're either not available nationwide or not easily accessible thanks to the required HPTC and home network. Other providers are working towards this nirvana as well; in fact, we fully expect 2012 to be the year of the whole-home DVR with more than a few providers unveiling similar systems. These include DirecTV's HR34, which is already available, but dependant on the unavailable C30 for whole-home action, DirecTV's answer to Dish's Joey. The way Dish's whole-home works is you place a Hopper on one of the TVs in the house and the smaller Joeys at up to three other TVs. 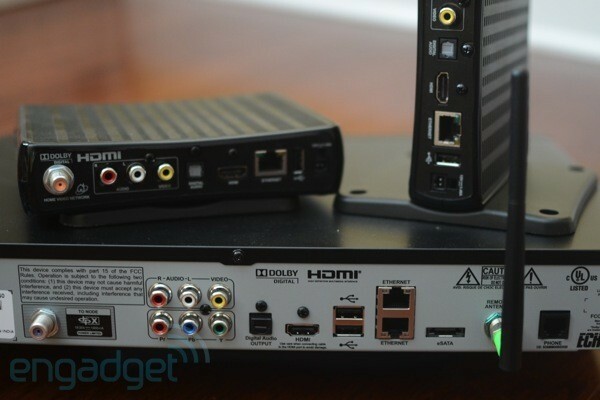 The Joeys connect to the Hopper via MoCA, which runs over coax so no special wiring or networking experience is required beyond what is required for any other TV service. The Joeys really do just work like the Hopper, with fast channel changes, a snappy user interface and a near-identical feature set. One of the few exceptions is that the Joey's don't do PIP, which means you only get a single live TV buffer. The other difference is that while you can join another TV's session from any television, only the Hopper can take over a session, effectively changing the channel in another room. To control this while watching a program, hit the red button to pull up a TV viewing status page. Now you might be concerned about the whole multi-room thing if you have kids in the home and there are some things in life they aren't ready for. Well, thanks to parental controls per TV, not only can you lock down what they can view in their room while not in your purview, but you can even prevent them from seeing what you're watching in a different room. One final item worth mentioning is that although you can only have three Joeys per Hopper, you can have two Hoppers in the house, but each Joey has to be assigned to one Hopper and the two Hoppers work completely independent of each other. After Echostar purchased Sling Media, Dish has been at the forefront of place-shifting. Unlike the 922 before it, the Hopper requires an optional Sling Adapter to watch content on portable devices around the home or out and about. Unlike the 922 and the 722, the smartphone and tablet apps can't control the Hopper or the Joeys, but we're told that feature will come in a future update. 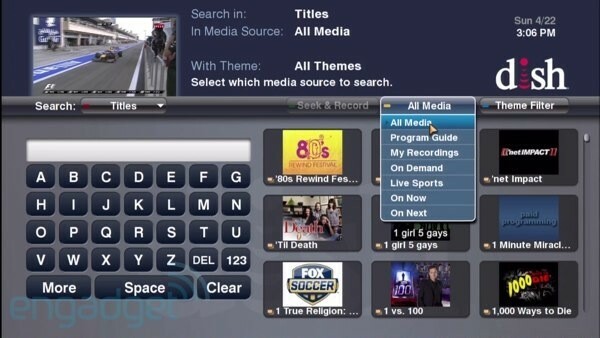 The ability to schedule recordings or check on your schedule from the website, smartphone or tablet is still there, as is the option to stream from the Sling adapter without trying to render the Dish UI on the screen just to find something to watch, take over the primary viewing experience of the set-top box or pay for separate Sling playback apps. Unfortunately, the Dish Sling has the same drawbacks as ever, like the fact that it doesn't always play the show you asked for because of a conflict. This is to be expected, except that you're not given any indication as to why it didn't work -- is an error message indicating the tuner is in use too much to ask? It isn't every day that a DVR comes along that not only delivers a sought-after feature but also introduces a never-before-seen perk. But lo and behold, that's exactly what Dish has done with the Hopper and Joey. There are a few quirks with the user experience, like the inability to view shows in a list and a cursor that seems to miss its non-existent touch screen remote. The biggest gotcha, though, might be the fact that the Hopper only works with Dish's TV service, which is typically missing at least one key channel thanks to ongoing carriage disputes. Additionally, it doesn't carry HD versions of all the broadcast networks, like PBS, in all markets and it requires a long-term contract for the privilege of leasing hardware that can never be owned. If you have Dish already and can't decide if it's worth the upgrade, don't overthink it: this upgrade is a no-brainer. If you're considering switching to Dish and you're worried about not liking the DVR as much as your current provider's DVR, you also have an invalid concern, as the Hopper is as good as any provider-issued DVR we've ever tried. In fact the only person we'd even hesitate recommending this to is the TiVo evangelist or Windows Media Center fan, and even in those cases, we could make a strong argument that the Hopper has more to offer. All that being said, things will get much more interesting when other providers get on the whole-home DVR game and start to offer as many TV anywhere options as Dish, but for now the Hopper offers some unique, desirable features that you just can't get anywhere else.